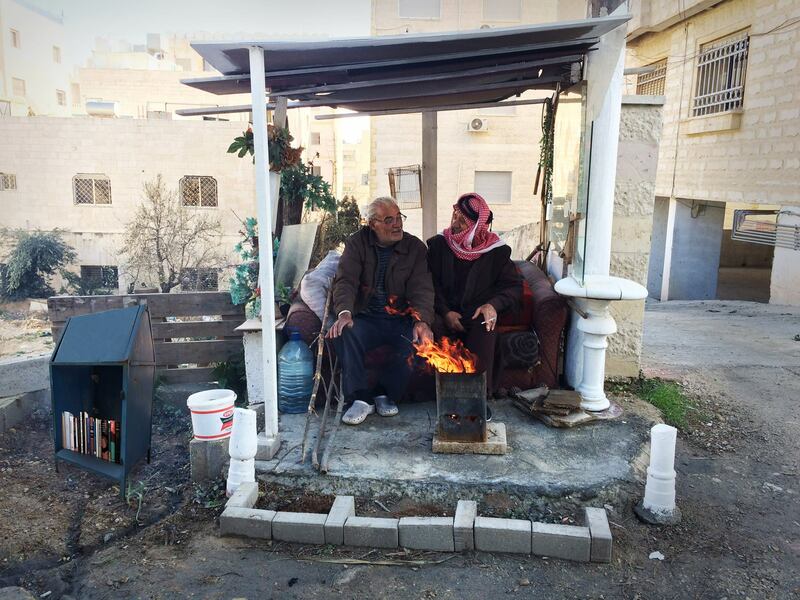 Conducted at the Lab in December, an investigative design workshop on ‘Amman’s Urban Furniture’ led by designer and ‘placemaker’ Rawan Kashkoush, stemmed an exhibition showcasing the research and findings of seven of the workshop participants. 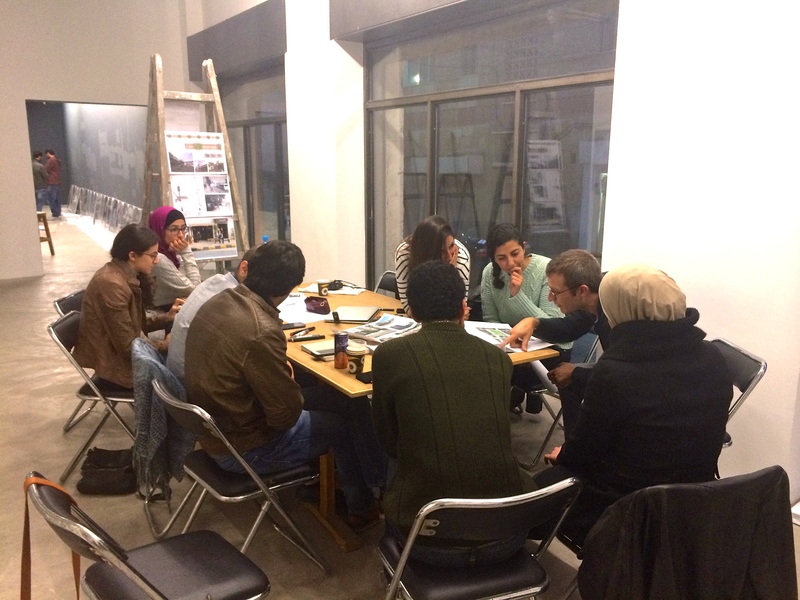 A live demonstration of placemaking, the workshop raised questions on the human relationship with Amman’s urban environment. In an effort to turn ‘space’ into ‘place, participants looked at alternative forms of seating as petitions to reclaim the public arena. 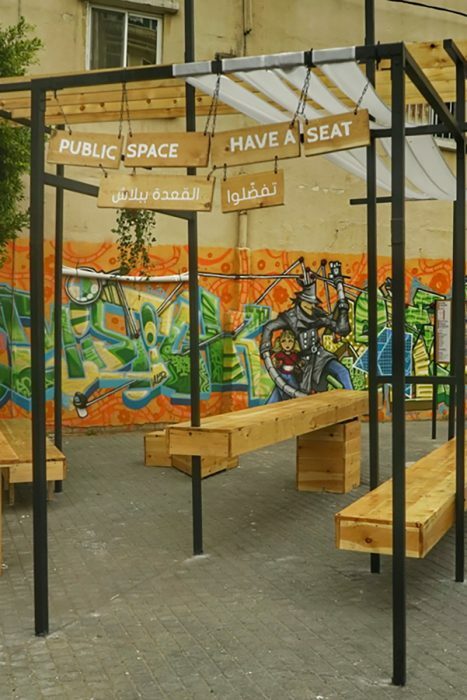 Placemaking fosters civic connection and builds social capital, ultimately facilitating interaction to improve societal development. 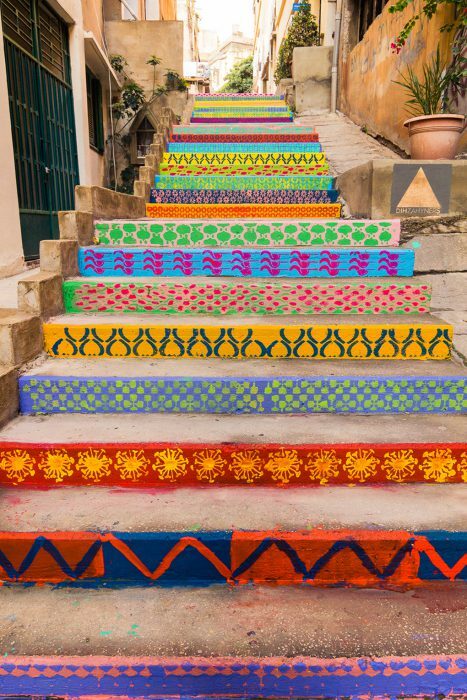 Placemaking empowers people by rooting them in the process of building useful public space. The importance of the process far precedes the product by giving citizens the right to affect change, to build a city that better reflects the people who live within it. 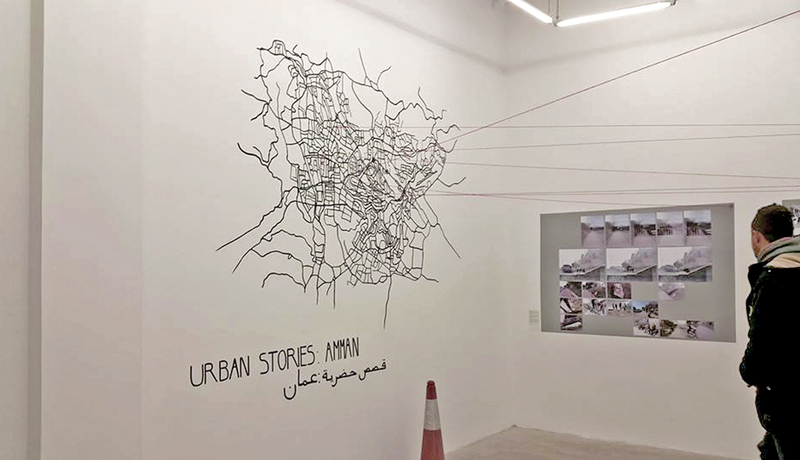 The exhibition displays seven case studies generated from personal observation, photography and video surveys of human interaction with Amman’s streets. 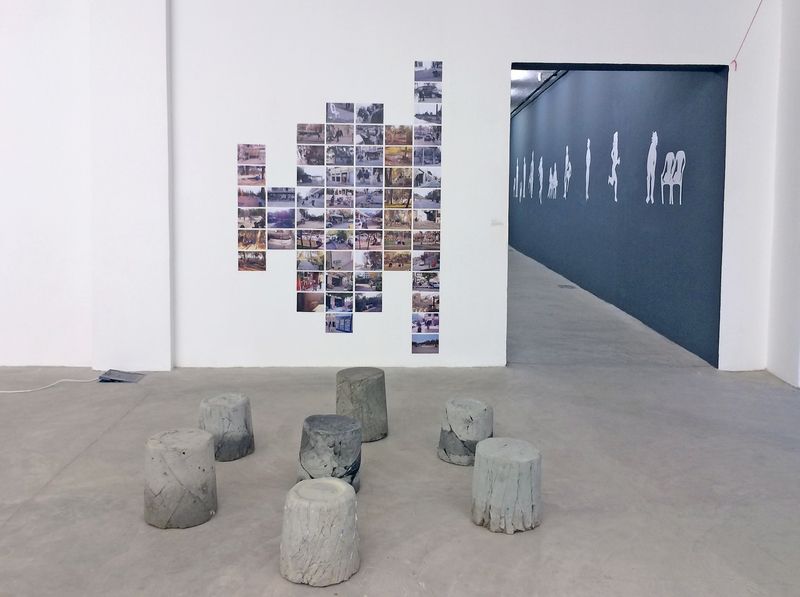 The participant’s explorations sought to track behavioral variations using urban interventions, mapping sidewalk interruptions, and experimentation with ownership and possession patterns. Functioning collaboratively, the participants formed a community, a consequence of successful placemaking. The opening of the exhibition displayed great enthusiasm by the audience quick to commend the creative solutions offered by the participants using existing resources to produce alternative forms of seating. Research images of human conduct in the city were also on display to draw correlation between the workshop phase and case study production inspiring discussions on local human conduct, while the case studies produced heated discussions on ownership of the public domain. A number of the cases are currently undergoing business development by interested parties, proving our community is ripe for experimentation. 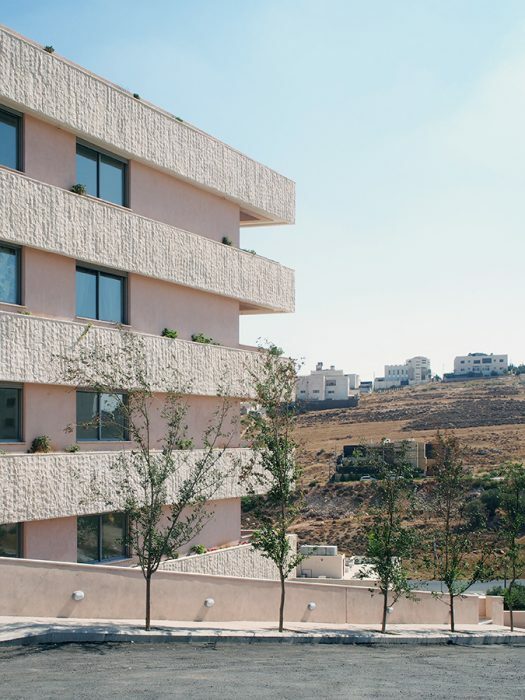 Sporadic development and accompanying infrastructure have isolated a scattering of rural landscapes throughout the city, resulting in pockets of land; grass-grown and peppered in stones. Tackling a service/taxi and bus stop, this collection point for public transport provided no momentary rest for those waiting. Large rocks with potential to be used as comfortable seating were carried to site from nearby locations, subtly arranged on the sloped soil to eventually attract users. This experiment seeks to better distribute existing natural elements to form temporary seating situations without disturbing the natural appearance of the landscape, maintaining an unforced over-all aesthetic. The suggestion is that built interventions are at times rushed solutions, slowing the impact will allow for improved situations to study user behaviors. The city is not void of attempts to provide it’s citizens physical comfort. This case study looks to unveil the transformational effects of repositioning existing resources by locating them in zones with higher pedestrian frequency; rendering them more effective. 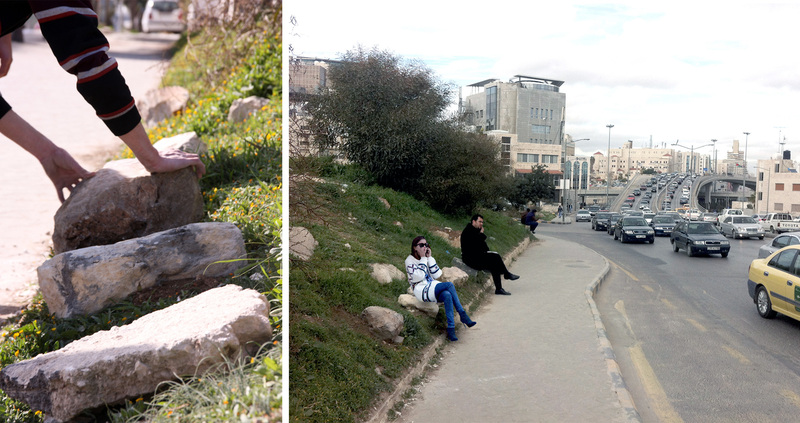 This experiment seeks to display and measure the impact of the relocation of an unused stone bench situated on a road divide beneath Mecca Street’s bridge to a nearby service/taxi stop with no available seating. Though unplanned, the experiment summoned the goodwill of onlookers who quickly recognized the experiment as an act of community service. The process engaged the participation of nearby parked taxi drivers – whom heavy lifted alongside the work-group, and directed the bench placement. This study witnessed a deep level of community involvement often undermined through top-down planning. 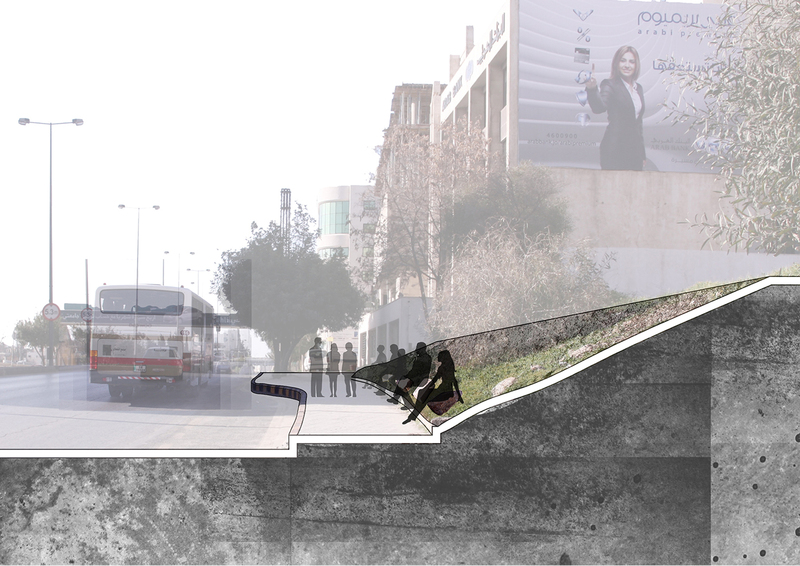 ‘the station’ is socially-integrative urban furniture, a subversive urban-intervention tool designed to improve the basic conditions of Amman’s sidewalks by providing shared seating space. 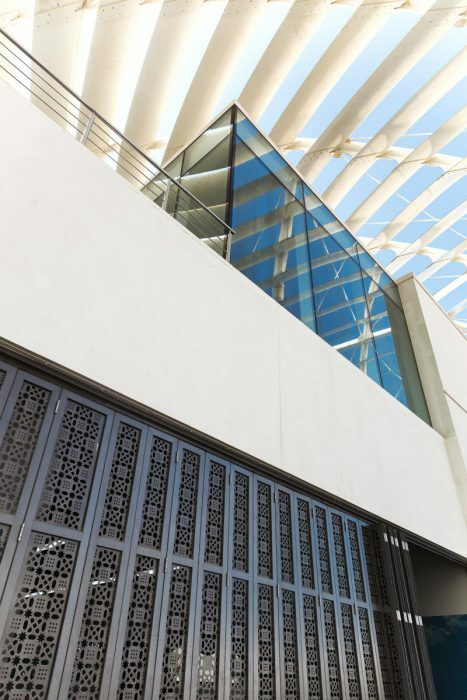 Moreover, the station transforms a vehicular-focused urban element into human-conscious landmarks. Months of observational research on whether public transport stations in the city meet pedestrian needs stemmed the overarching theme of a lack of seating, where instead users spend a majority of their time standing until transport has arrived. Second to standing, the use of a short step or parapet is relied on for rest, at times resulting in use of the sidewalk itself. An elderly woman waiting for her bus was seen embracing a nearby street-light in a state of obvious exhaustion. Here in lied a possible solution. Using the street-light as the foundation for seating, adjoining a single element would take advantage of the existing structure to lean on, and light itself – forming an ‘island’ for rest. Looking to re-use existing resources, the ‘Jersey Barrier’ is adopted and merged with the street-light. 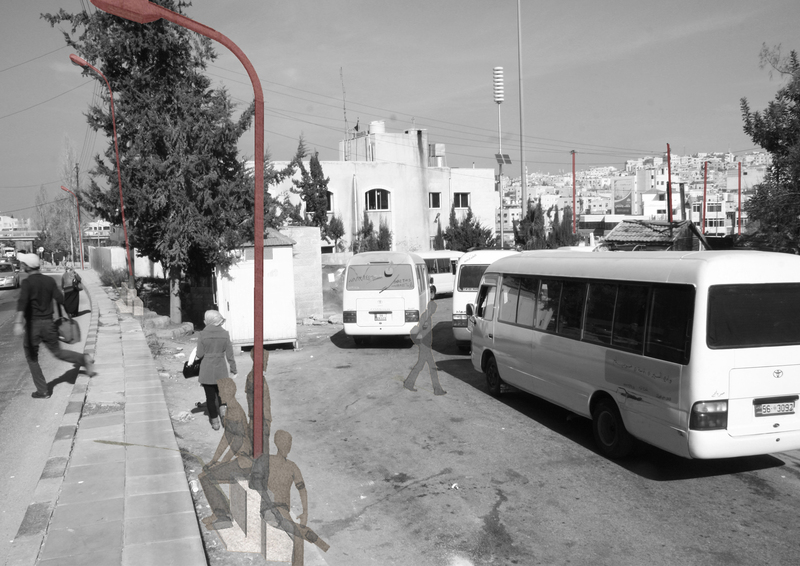 Keeping in consideration Amman’s often narrow or saturated sidewalks; the design unit is placed in parallel with the street to minimize space consumption, and can be used by up to four people. 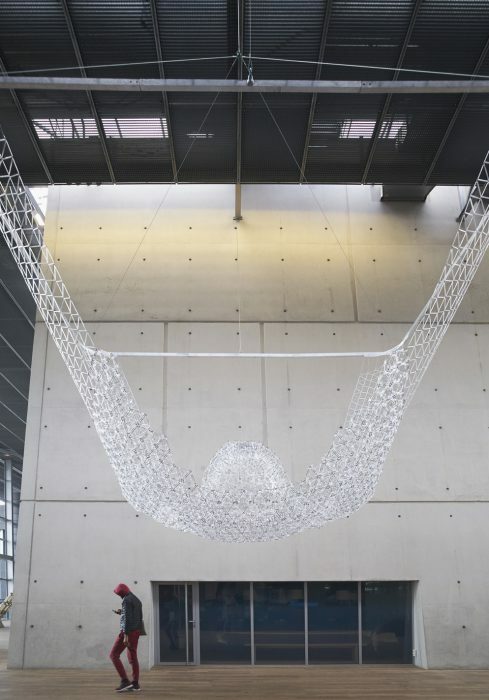 ‘the station’ suggests inspiration for future solutions. 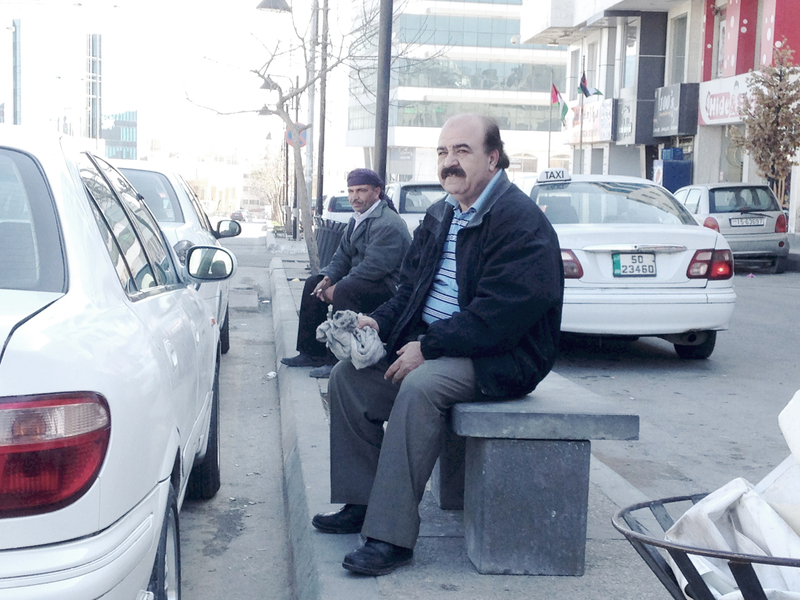 The undertaking of this study was specific to Madina Street’s segment ‘Shari3 el Jo3aneen’, though those familiar with Amman’s sidewalks will immediately recognize these observed trends in sidewalk interruptions. Looking to study the existing situation of a highly trafficked fast-food restaurant district, this case study displays the creative solutions for seating offered by the street level tenants, harshly contrasted by the typical lack of consideration for pedestrians by planners/owners and users themselves. Priority is proven to be for vehicular access. 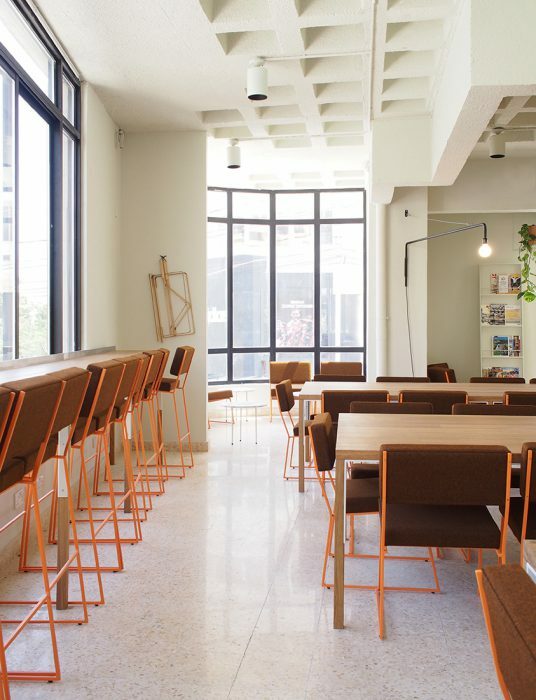 Observed as neighborhood points of convergence, ‘Rumi’ café in Weibdeh, Abdul Hamid Shoman Library, and ‘Creative Ammo’ by Jordan University, come together to form neighborhood heroes. Rumi, a favored watering hole, the Shoman library a provider of free books, and ‘Creative Ammo’ an industrious neighborhood dweller unite in this case study to illustrate and celebrate elements of all three; as a public library-urban furniture element designed, manufactured and installed. 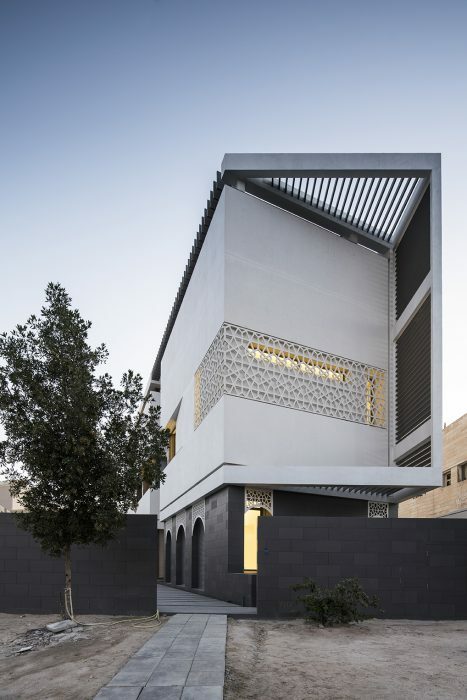 The design is inspired by the post-office mailbox on the same wall of the site at Rumi café, the product seeks to attract readers and donators of books alike. 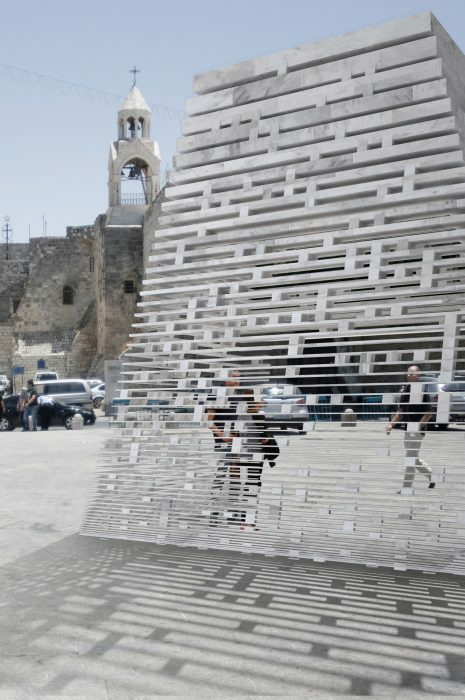 The intention is to honor the existing success of public book-donation by multiplying the object and anchoring it to a neighborhood caretaker, and eventually be adopted as an autonomous culture marker. 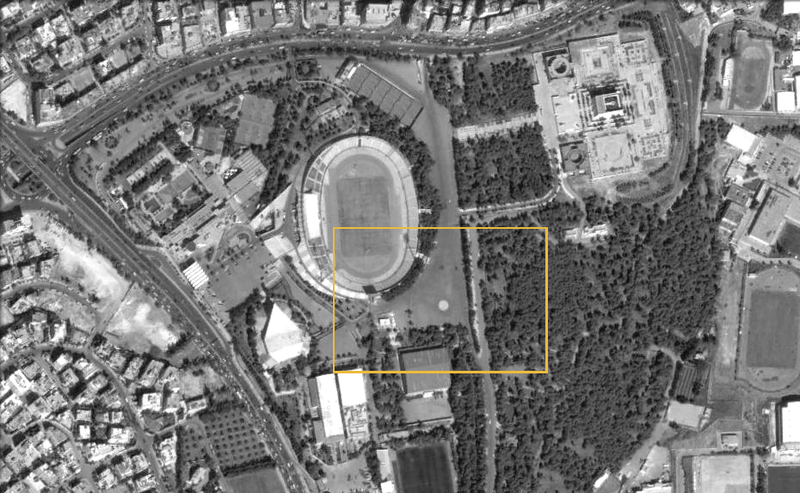 The project is a result of an analysis of public seating in the sport city complex, particularly the large scale parking lot at the entrance to the jogging track and the landscape around the track itself. The parking lot contains a bicycle renting booth and is usually buzzing with activity with cyclers from of various age groups. No form of public seating exists within the parking lot area. 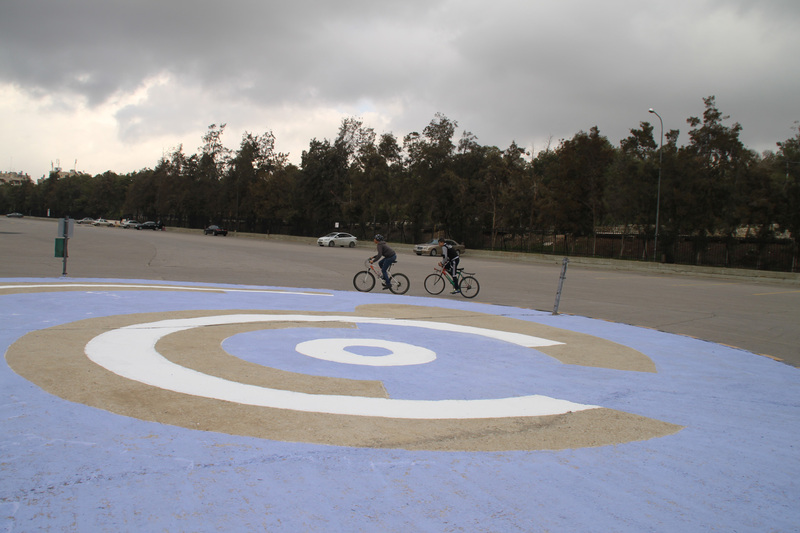 Through observation, it was noted that users tend to gather and sit on the single 14m wide roundabout. The roundabout acted as an island within the vast concrete surface of the parking lot, allowing users to rest and observe the action. 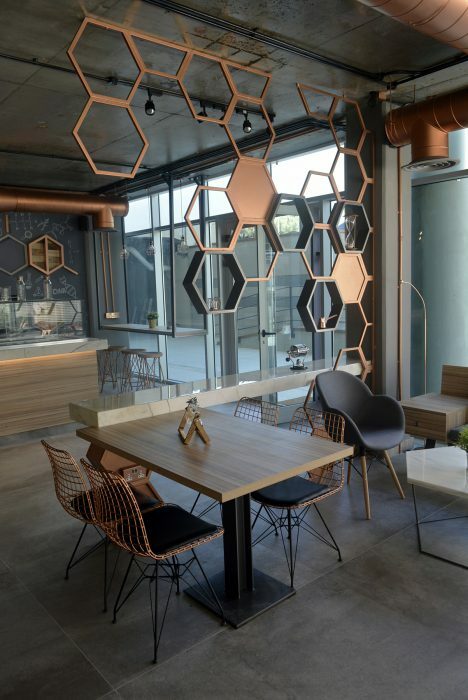 In addition, its location at the entrance of the jogging track gave it the function of a public lobby. This design is proposed for a seating layout enhancing the role of the island for public seating and creating an entry statement for the jogging track and picnic area. The layout allows for different degrees of extroversion/introversion and derives its shape from the circular form of the roundabout. A tree will be planted to provide shade and to visually tie the island to its context. 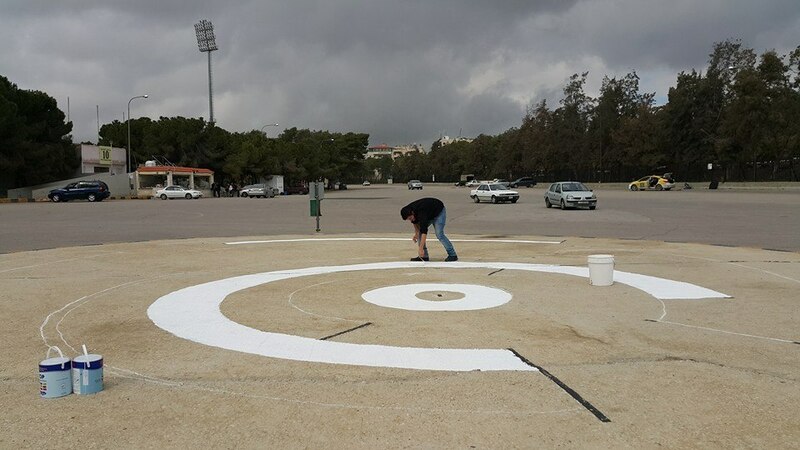 Until further development and funding is achieved to construct the project, the designed seating layout has been implemented as a two dimensional floor art piece with the help of volunteers. 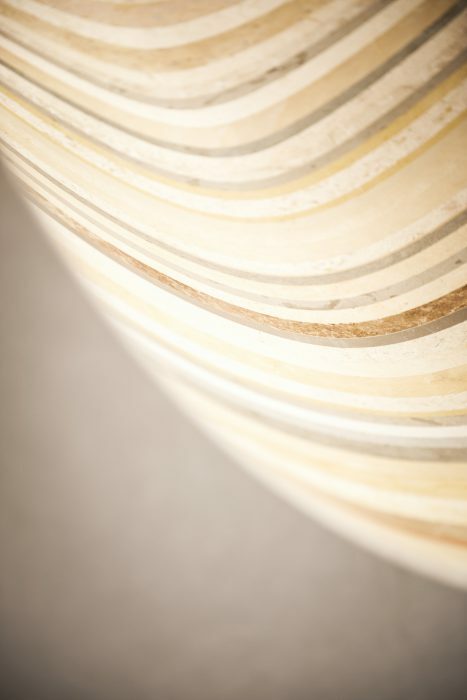 The painted floor work is an introductory gesture for the ensuing realization of the project. ‘The Wadees Circle’ is the beating heart of its immediate neighborhood; a place to have coffee, buy groceries and locate certain services. The relatively small roundabout is center of a commercial block within a residential district. 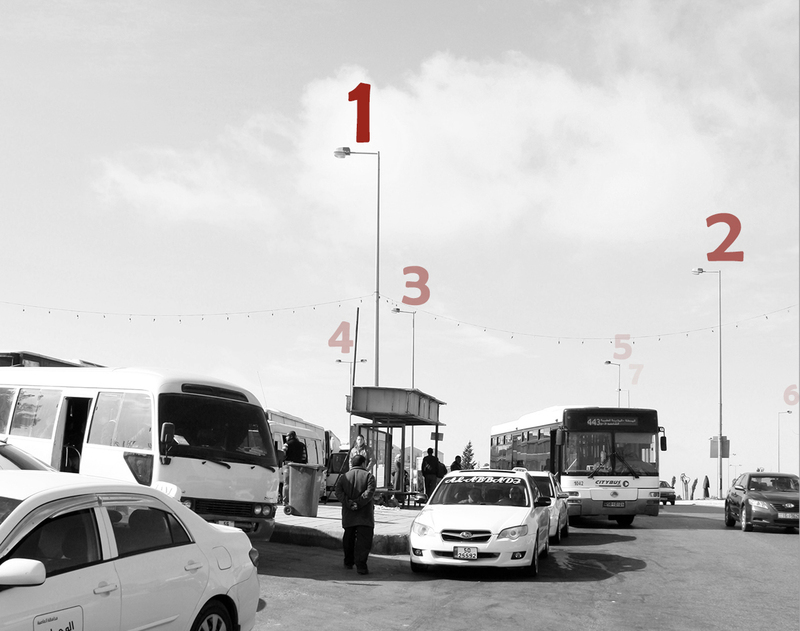 At its corners, residents and employees collect to pick up their taxis. As they wait for transport, seats and shelter are unavailable. 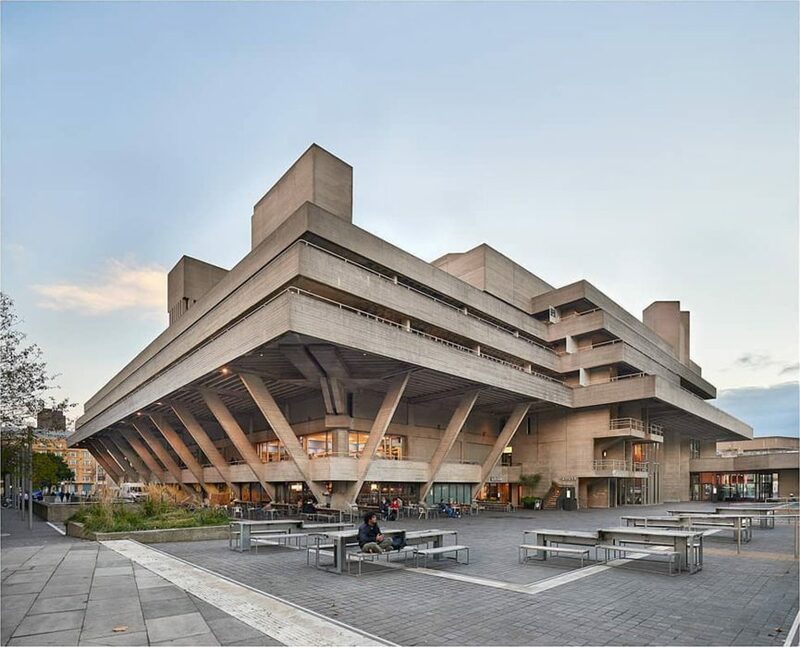 With aspiration to provide a design solution to make the wait more comfortable a study of the site in question is carried out. The circle is observed over the course of one full week during which experiments are conducted and developed, and behavioral patterns recorded. A variety of seating objects are placed on site to test levels of acceptance and exchange. 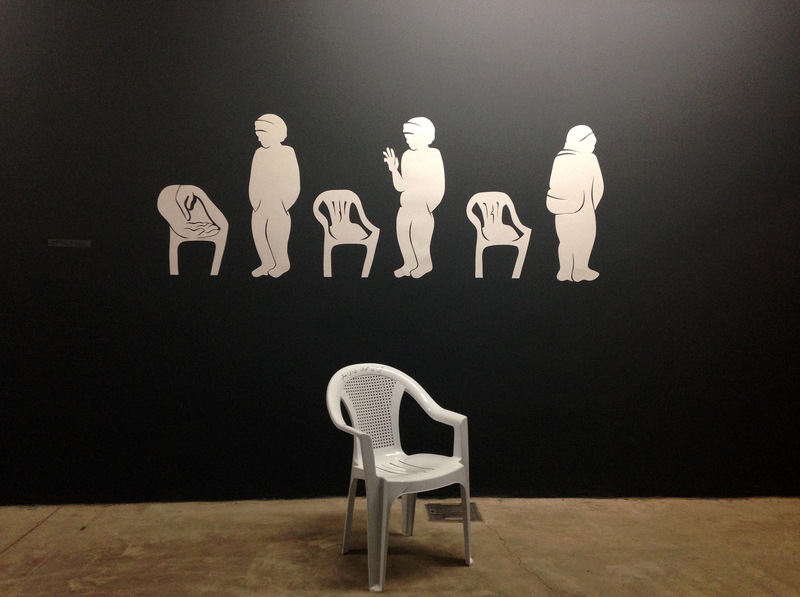 The experiment resulted in stories depicting events outside of initial hypotheses, such as unprecedented ownership patterns with the plastic chair, and long-stay recreational use by younger residents. 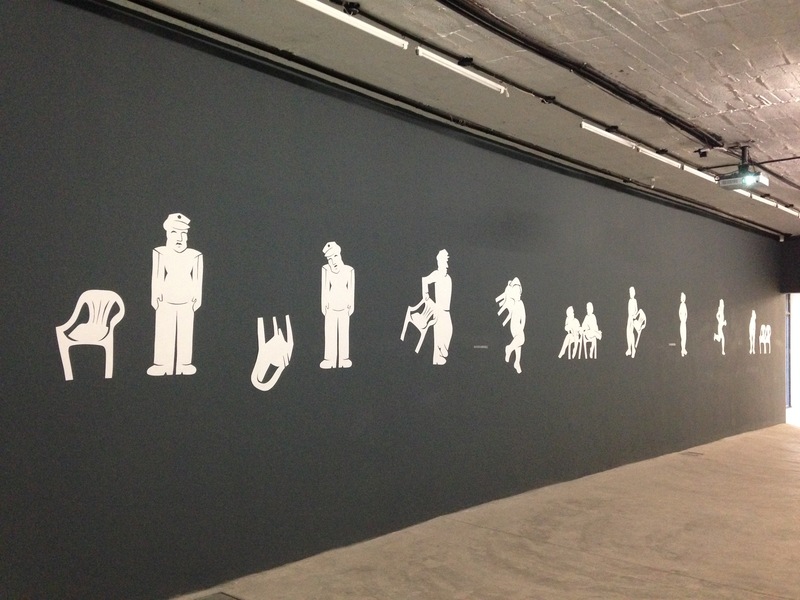 Recorded video footage of real events produced cutout drawings depicting a selection of the Wadees circle stories.